Société Réaliste, “Limes New Roman” (Detail), Part of Pligatures. “Limes” is a latin word that modern historians gave to the system of Roman fortifications established all along the borders of the Empire. It physically signals limits between territories, in terms of customs as well as with defensive aims. This terminology has been revived for the creation of a typography, “Limes New Roman”, registered by the artistic cooperative Société Réaliste and published in the Icon’s part of the issue #35 of the journal Multitudes, in winter 2009. This project forms a part of a corpus of cartographic experiments gathered under the French-neologism Pligatures1. This group of proposals questions, by the decorative transposition, our world’s representation in regard of History and more particularly maps produced with their bundles of uncertain information: “Quite often, fields of texts even than decorative elements deliberately cover some map’s areas about which we only had uncertain informations at the moment of the making of the globe”2. 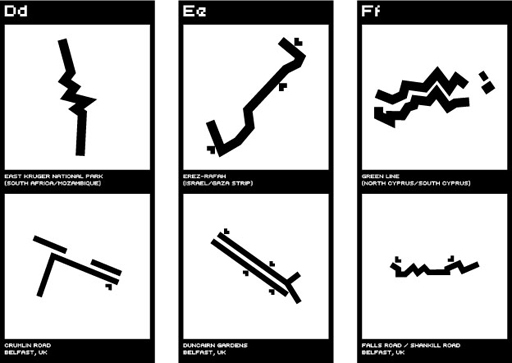 The font “Limes New Roman” draws up a catalog of boundaries, security barriers, lines of control and barricaded checkpoints operating between states, in order to figure out the uppercases and then between districts for lowercase. It remains an incomplete alphabet, interrupted to the minimum Latin form, which is lacking the ability to bring us the migratory effects on transmission, language, the question of communication and information. This alphabet appears as a clever and silly game about relations between representation, enunciation and the notion of traces both historical and sociological. In fact, it is not new for Société Réaliste. Since their creation in 2004, the group involves itself in present and past political organizations in order to find again etymological and iconographical collusions. The work of Société Réaliste looks on political structures, production and art economy with a sharp eye, and gathers some research’s enterprises applied in the field of territorial ergonomy, experimental economy, counter-strategy, or in particular political design. Société Réaliste’s name comes from the reversal of Socialist Realism, which as Elisabeth Lebovici reminds, is a doctrine quoted in a USSR writers’ congress in 1934, based on a thought about Maxime Gorki: “his realism is socialist”. A doctrine which, “was going to extend by a hegemonic way on a part of the world its esthetico-political’s ideal of transformation, but staying on the periphery of artistic debates around modernity, and widely far of those concerned by the sources of postmodernity. Around the 1960s, ‘a demonstration in favor of Capitalist Realism’ also briefly and suddenly appeared, in a furniture shop in Düsseldorf, by Gerhard Richter, Sigmar Polke, Konrad Lueg and Manfred Kuttner.[...] In both cases – as the Socialist one and as the Capitalist one - the word Realism stayed: an esthetic identity formed in the nineteenth century, not on the moral principle of reality’s fake, but as a quality of representation about the real in his singularity”3. “Pli” means in English the “Fold”. A marker let by a flap of soft material on itself and “ligatures” for the overlapped aspect of two parts usually separated. Pligatures concerns the plastic processes of folding an object to transform it and producing ligatures to relate heterogeneous objects. By Pligatures also, Société Réaliste intends to coherently interfere with its research on glyphs and graffitis, on classical and experimental cartography, on logotyping, heraldry and vexillology or on frontiers on a less derivative point of view. 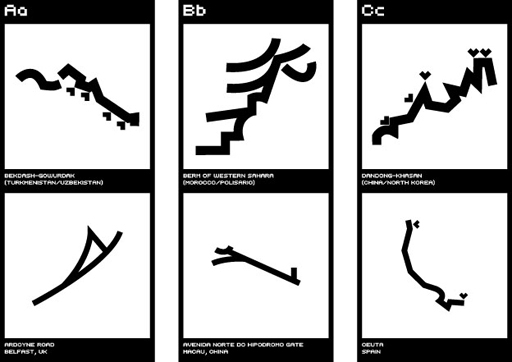 Pligatures is composed by: Barbarus; Cartophony of the Land of the Free; Dymaxion Palace; Esprit; Cosmopolites de tous les pays encore un effort (grphic view); EUGCL: résultats questionnaire; Eugonics; Limes New Roman (detail); Prototype of frontier; Rockall; United Nations Brown. Quotation from the notice board of The Terrestrial Globe, Globenmuseum, Vienna. Extract from Elisabeth Lebovici “A project of society”, in Multitudes, #35, winter 2009. Soit “Pli”, la marque laissée par le rabat d’une matière souple sur elle-même, et “ligatures” pour l’aspect imbriqué de deux parties usuellement distinctes. Pligatures est composé de: Barbarus; Cartophony of the Land of the Free; Dymaxion Palace; Esprit; Cosmopolites de tous les pays encore un effort (grphic view); EUGCL: résultats questionnaire; Eugonics; Limes New Roman (detail); Prototype of frontier; Rockall; United Nations Brown. Citation inscrite sur un panneau d’information The Terrestrial Globe, Globenmuseum, Vienne. Extrait du texte d’Elisabeth Lebovici “Un projet de société” paru dans le n°35 de la revue Multitudes, Hiver 2009. Posted by Diane Pigeau	on Wednesday, March 18, 2009 at 16:20.